Hospital, that word must be something that makes you terrified or afraid. However, it is not for me and this is not a horror story. It becomes part of my thoughts every time I feel annoyed with my little brother. So, it was almost ten years ago, when my ojek driver called Pa Aya told me that my mom had finally delivered her third baby. I was a little shocked but excited at that time. Our family was expecting a boy, but for nine months my dad asked the obgyn not to tell them the baby’s gender. Therefore, when Pa Aya said, “It’s a boy, Mba!” then I guess you can already imagine how happy I was. As soon as I arrived at a midwife house, I heard a squall filled the entire place. However, I had no thought that it would be a bad sign for the baby. I met my mom first, felt so proud seeing her still in her weak condition and welcomed me by the word “Waalaikumsalam..” she said, I kissed her hand and again I’m so proud of her by imagine going through three pregnancies and birth processes. It was not so long after I came and talked with my mom, when my father arrived with his car. And I was a little shocked when some of my neighbors, which I assumed they were the heroes who helped my mom went to the midwife house, and some of the nurses came out with the crying baby who I assumed he was my brother. Then they were gone. I stepped out of the room and asked one neighbor who left called Mba Tiwi, “Mba, what is going on? Why Daddy was gone with the baby?” then she said, “All I understand so far, is that your brother has some problem within his body and he needs more intensive care in bigger hospital”. Then the first thought came out in my mind was, my mom. She must be felt guilty, worry, and disappointed all at once. For the next three days, I only left in our house with my little sister, and my neighbors. At the fourth day, my dad finally came home and explained what was going on to me and my little sister. All he wanted us to do was praying for my brother’s recovery. Then, for the next two weeks, hospital where my brother was hospitalized became my new regular place after the school ended. I asked my dad if I could come to the hospital every day after school, and he said no at the first time. However, I told my dad that it was all for my mom. She was still weak at that time, and she was not permitted to see her baby. Therefore, I insisted to come to the hospital every day and told her every single progress about my brother. Then, my dad allowed me to come. Bhakti Kartini I still clearly remember the name of the hospital. It was green, was not so far from my house. However, the thing I hated the most was that the hospital surroundings was dark, not so much lighting, I could say that it was dimly lit. Until now, the hospital part that I am most familiar with is the NICU corridor. It was not so far from the main entrance of the hospital, but it was really smelly. You know, it was the hospital smells. At the NICU room where my little baby brother was treated, there was a large glass that allowed us to see the babies from the outside. Through the outside, I saw that there were around four incubators with babies in it. On the big glass, there were an announcement ‘Children under 13 years old is not allowed to enter this room, no food, or drink is allowed in this room, please wear the sterile clothes which we have prepared at the entrance door before entering NICU room’. I was ten years old, so I could accept my fate that I was not allowed to see my brother closely. However, due to my height which made me look like a fourteen years old, my dad bravely lied to the nurse in the NICU that I was already fourteen. So the nurse allowed me to enter the NICU room. Once I opened the entrance door to the NICU room, I muttered to myself ‘Wow! This room is really big, a lot of patients in it, but where is the babies?’. So I just followed my dad who led the way. He entered a green door with so many cute stickers on it, which I guessed this was the babies NICU room. Then it was! 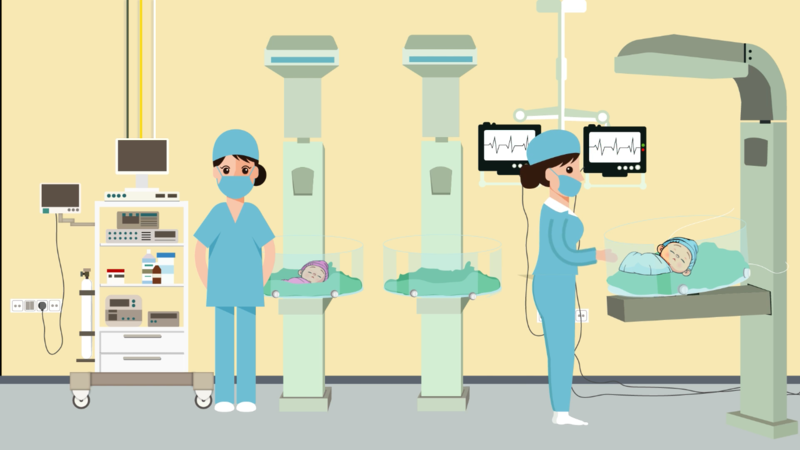 The first impression I thought about the NICU room was the smell was stronger than in the corridor, it was noisy by the hospital equipment that is attached to the patient’s body. I was excited by the fact that I was finally able to meet him this time, but sad at the same time because we had to meet each other in that situation. “The first day we brought him here, his body was purplish, his cry was weakened, and I was almost lost the hope for him. However, he already passed his critical state now, you can see how healthy he is now, and he eats the food very well through the intravenous hose. The amniotic liquid which poisoned him was mostly removed from his body” explained my father, then I asked him “then how about mom’s breast milk which are delivered here every day? Did he drink it?”. Yes, every time I came to the hospital with my ojek driver, my mom would ask me to bring the pumped breast milk for my brother. “Of course he liked it, that’s why he is already in his speedy recovery right now” said my father. The visiting hour was end. I came out of the NICU room with my dad, and we sat on a long chair in front of the big glass of NICU room. We talked and he told me that the baby’s name is ‘Muhammad Tegar Putera’. What a meaningful name! I thought. Before he was born, my dad always told us that the name will be Egar, but now it’s Tegar due to his spirit against his illness. However, we still called him Egar until now. That was my tenth days at the hospital. But something was caught my eyes when I saw my brother through the big glass. He was alone. He was not with the other three previous babies. I ran into my dad and asked him where they were. “two of them were passed away last night, only 3 hours apart after the first one died, and for the other one, her parents decided to move her into another hospital” answered my dad. “So Egar is the only one left now?” asked me, answered by my dad’s nods “then he is the strongest here” said me again. Only five days after that conversation of me and my dad, the doctor declared that Egar was finally allowed to go home. It was a very exciting day. All of my close neighbors, my grandmother, my uncles and aunts came to pick us. They helped us brought our luggage and excitedly congratulated my parents and Egar for successfully passed the patience exam from God. Then, that’s how Bhakti Kartini hospital becomes a memorable place for me, because every time I passed through the hospital I will remember the days I spent there with my dad and talked to my baby brother who was sick. However, now Egar grows up as a healthy boy that we proud of, and always told him that Bhakti Kartini hospital is his place of merit every time we passed through that place.